When it was first introduced, the Lexus ES was the car that you bought when you got your first promotion into management. Back in 1990 it was a barely-warmed-over Toyota Camry with leather seats and some shiny trim pieces inside and out, but it was a Lexus, and to some people that’s all that mattered. Almost 30 years later, the Lexus ES is a tour de force of its own. No longer an entry-level Lexus model, the ES is a full-fledged premium car, with little in the way of compromise. And it’s not small, either, sharing a platform with the full-sized Toyota Avalon and offering a supremely comfortable back seat. The question, then, is whether or not the redesigned 2019 Lexus ES makes the ranks of cars typically owned by members of the C-Suite. For this review, we evaluated a 2019 Lexus ES 300h with a base price of $42,455 (including $1,045 destination charge). Options included a Premium package, navigation system, Mark Levinson premium surround-sound audio system, wireless smartphone charging, hands-free power trunk, parking-assist system, blind-spot monitoring with rear cross-traffic alert, power rear window shade, wood interior trim, and upgraded aluminum wheels. The price came to $50,965, including the destination charge. Before we discuss the results of our evaluation of the 2019 Lexus ES, it’s helpful to understand who bought the previous version of this compact premium car* and what they like most and least about it. Compared with the segment as a whole, Lexus ES buyers are older (median age of 67 vs. 56 for the segment) and more often women (38% vs. 32%). Lexus ES buyers also make less money, with a median annual household income of $146,875 (vs. $151,531). In terms of psychographics, Lexus ES buyers are very different from those in the broader segment. They are far more likely to strongly agree that reliability is a first consideration when they choose a new vehicle (75% vs. 52% at the segment level), and they are more likely to strongly agree that they avoid vehicles they think will have high maintenance costs (62% vs. 43%). More than one third of new Lexus ES buyers agree that a vehicle is just a way of getting from place to place (35% vs. 25%). Perhaps not surprisingly, image and performance are less important to Lexus ES buyers. Just 30% strongly agree that they like a vehicle that stands out from the crowd (vs. 45% of buyers in the segment), and only 43% strongly agree that they like a vehicle that offers responsive handling and strong acceleration (vs. 67%). Lexus ES buyers are also more likely to agree that they will pay extra to ensure that their vehicle has the latest safety features (90% vs. 85%), and they are more likely to agree that they will pay extra for a vehicle that is environmentally friendly (59% vs. 51%). Fuel economy is important, too, with Lexus ES buyers more likely to agree that this is a first consideration when choosing a new vehicle (54% vs. 42%). Buyers say their favorite things about the previous-generation Lexus ES are (in descending order) the engine/transmission, driving dynamics, visibility and safety, seats, and interior design. Buyers indicate their least favorite things about the previous Lexus ES are (in descending order) the exterior styling, climate control system, storage and space, infotainment system, and fuel economy. *J.D. Power classifies the Lexus ES as a compact premium car because its main competitors are typically much smaller but in the same price range. Unlike the conservative approach to exterior design taken by German carmakers, and in a move that seemingly flaunts the preferences of existing ES customers, Lexus decided to go the full Monty with the redesigned 2019 version of the car. Flash and sizzle are the rule, with lines and angles that are a bit eccentric, and border on esoteric. But the ES takes it all in stride, transforming the drama into a harmonious design. In my opinion, it’s the best manifestation of the modern Lexus family look. What otherwise seems overbearing on a taller crossover or bigger sedan (that grille!) 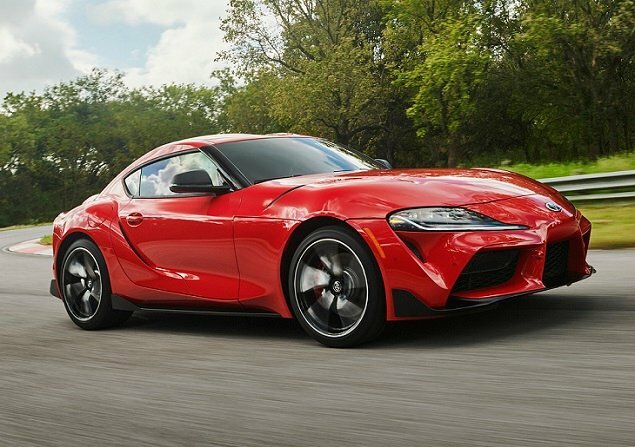 is comparatively muted on the ES, while the car’s lower-profile front fenders and hood scintillatingly sweep rearward from its spindle-shaped edges. 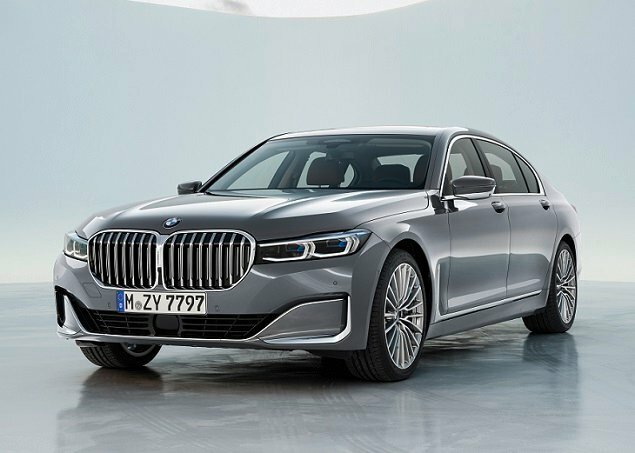 Compared with the previous ES, the 2019 version is longer by 2.6 ins. and wider by 1.8 ins. The wheels have been pushed out, too, resulting in a stouter stance than the previous version, which had a long rear overhang. My test vehicle was outfitted with the 17-in. 5-spoke alloy wheels, which complemented the overall look of the car. 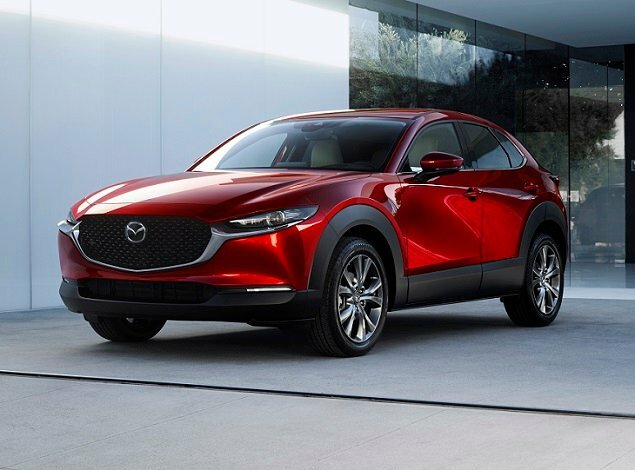 Exterior styling is something that ES buyers rated mid-pack with regard to their favorite attributes, so the 2019 version might perform better in terms of overall appeal. At the same time, though, ES buyers are less likely to want to stand apart from the crowd, so the new styling could have the opposite effect. Much of the cabin is prettily furnished, with top-notch materials assembled with care. Start closely investigating some of the trim pieces on the lower part of the cabin, though, and you might find reason for disappointment. My test vehicle was dressed in black on black, with little in the way of visual interest or contrast. While researching the car, I wished I could have experienced the beautiful high-contrast Chateau or Flaxen upholstery that is available for this car. Still, the cabin bears a premium appearance, with sword-shaped slashes of wood trim and subtle topographic patterns on the seats, center console, and dashboard. Sitting inside the ES you get a sense of what people usually have in mind when they’re talking about the luxurious car their aunt just bought. It’s not over the top, but the front seats are wonderfully comfortable and supportive, and with 10-way power adjustment to find an ideal driving position. The rear seats have ample space for heads, shoulders, and legs. I’d bet three full-size adults can sit there without uttering a peep of dismay. It poured rain in Los Angeles during my week with the ES, and temperatures were chilly but, this being California, never downright cold. As a result, the weather did not tax the climate control system’s effectiveness. The climate controls are blessedly divorced from the Remote Touch Interface infotainment system, and are simple and easy to use. The test car’s front seats, wrapped in soft Lexus NuLuxe leatherette, were both heated and ventilated, which further increased satisfaction levels. Dominating the top of the dashboard, the test car had a 12.3-in. infotainment system screen accompanied by the traditional Lexus analog clock. It looks great, but is not the easiest system to learn to use. The screen is not touch-sensitive like your smartphone. Instead, you must use the Remote Touch Interface pad on the center console to activate a mouse that moves around on the screen as your finger moves on the pad. Personally, I find this approach distracting and, making matters worse, often inaccurate. Such user-experience gaffes are common as automakers attempt to balance the aesthetics of increasingly complex automobiles with the simplicity of well-marked knobs and buttons. In a nod to old-school design, the ES does have a combined power/volume/tuning knob. Push it to power the stereo on or off. Turn the top knob to adjust volume. Turn the bottom, wider knob to tune to a different station. This is an elegant solution. Apple CarPlay is on the standard features list, but Android Auto is still missing. 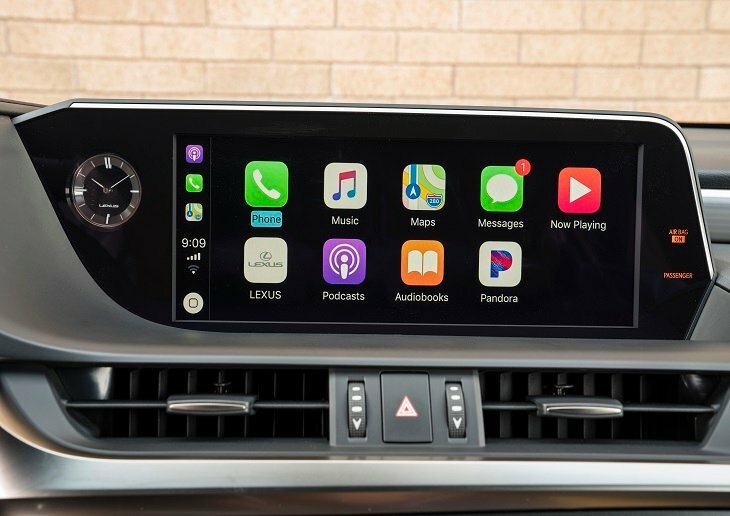 Toyota did announce the addition of Android Auto in association with news for the 2020 model year, so I assume the Lexus ES will get it soon. My test car also had the optional dynamic navigation system, which is free for the first three years of ownership. After that, it requires a subscription. The navigation system is bundled with a powerful Mark Levinson audio system, and Lexus also gives you a year of free Wi-Fi hotspot connectivity, up to use of 4GB of data. Perhaps best of all, you get 10 free years of Enform Safety Connect services, including automatic collision notification, emergency calling, and more. Pop open the trunk and you’ll find 16.7 cu. ft. of cargo capacity, a generous number for any midsize sedan. Notably, the ES 350 and the ES 300h share that figure; you won’t lose out on any trunk space due to the hybrid’s battery pack, which is located under the rear seat. Around the cabin, you’ll find lots of storage, with a good-sized center console bin and glove box. They could have made the folding rear armrest with a storage cubby, but no. There are some cupholders, though. Optional parking sensors give the driver a good sense of where the car begins and ends, and I think they’re a necessity. With that said, outward visibility is good considering the car’s swept roofline, and oversized side mirrors help maximize the view out. Lexus offers a fairly comprehensive suite of safety features as standard equipment for the 2019 ES, including a forward-collision warning system with pedestrian detection, automatic emergency braking, adaptive cruise control, lane-departure warning with steering assist, and automatic high-beam headlights. Curiously, you have to pay $1,065 extra for a blind-spot monitoring system with rear cross-traffic alert. It really should be on the standard equipment list. In addition to these features, the new Lexus ES is structurally talented at protecting its occupants. 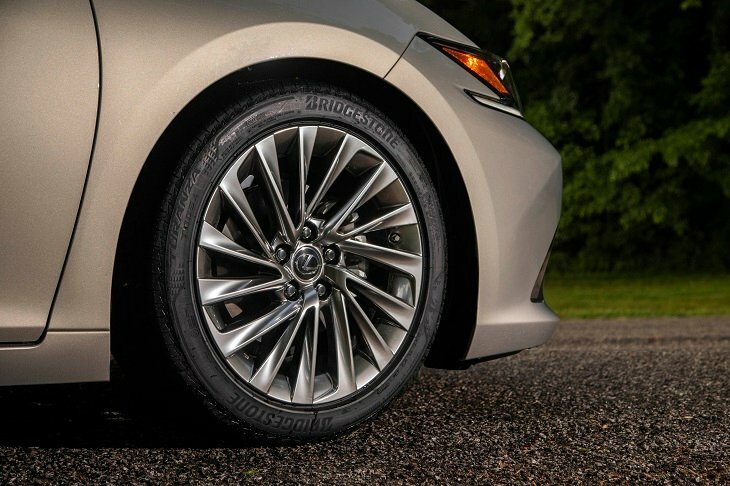 The Insurance Institute for Highway Safety (IIHS) awards the 2019 Lexus ES with a “Top Safety Pick+” designation, but the federal government had yet to test the ES when this review was published. 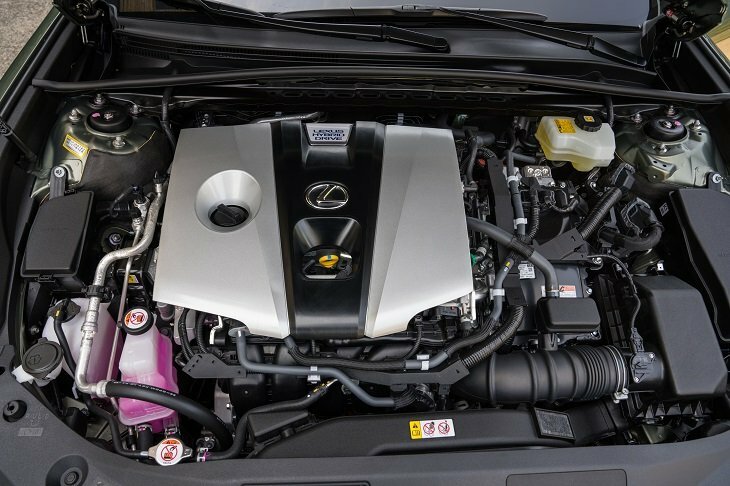 Residing under the hood of the ES 300h are two electric motors paired with a 2.5-liter 4-cylinder gasoline engine. A nickel-metal hydride battery that is housed under the rear seats powers the electric motors, and regenerative brakes keep the battery powered up. Combined, these components make 215 horsepower, and a continuously variable transmission (CVT) delivers the power to the front wheels. While that’s quite a decline in power from the ES 350, whose V-6 makes 302 horsepower, you won’t feel like you’re missing out, either. With a nice little snarl upon tip-in—and the immediate torque from the electric motors—the ES 300h hybrid feels much faster than the numbers might suggest. According to J.D. Power research, Lexus ES buyers love the engine and transmission of their sedan, and that sentiment should continue for 2019. Unfortunately, while the ES 300h is unexpectedly satisfying in terms of its power, this hybrid stops well short of its high-achieving promise when it comes to fuel economy. The EPA says that the 2019 ES 300h should get 44 mpg in mixed driving conditions (43 city/45 highway). I barely managed to eke out 37.2 mpg on my test loop, and a week of driving yielded just 38.1 mpg. Buyers cite fuel economy as their least favorite aspect of ES ownership, and the ES 300h isn’t likely to change this opinion unless its efficiency is evaluated outside of the context of the EPA estimates. With its small 13.2-gal. fuel tank, fill-ups will cost little. The 581-mile range that Lexus promotes on its website is optimistic, though, by at least 100 miles based on my experience driving. Driving a Lexus ES used to be a snoozefest, as the car was tuned to deliver an isolated, smooth ride at the expense of handling and athleticism. That’s not true anymore. While you wouldn’t call the 2019 Lexus ES 300h a sports sedan (maybe the ES 350 F Sport qualifies), it’s a lot more dynamic than before, tuned to deliver a terrific blend of comfort and compliance while still providing a decent amount of road feel. On my test loop, I felt a bit of wallow when pitching the ES into sharp corners, but unexpectedly it bit into turns and came out hungry for more action. Furthermore, the steering, while heavy, proved precise and progressive. And although the brakes were a bit abrupt, as most regenerative brakes are, it’s easy to get used to modulating them. Experiencing the solid, confident nature of the Lexus ES, you can see the appeal of luxury vehicles that make you feel like you’re cocooned from the cold, damp, chaotic world outside. But now, the ES isn’t nearly as boring to drive as it used to be. 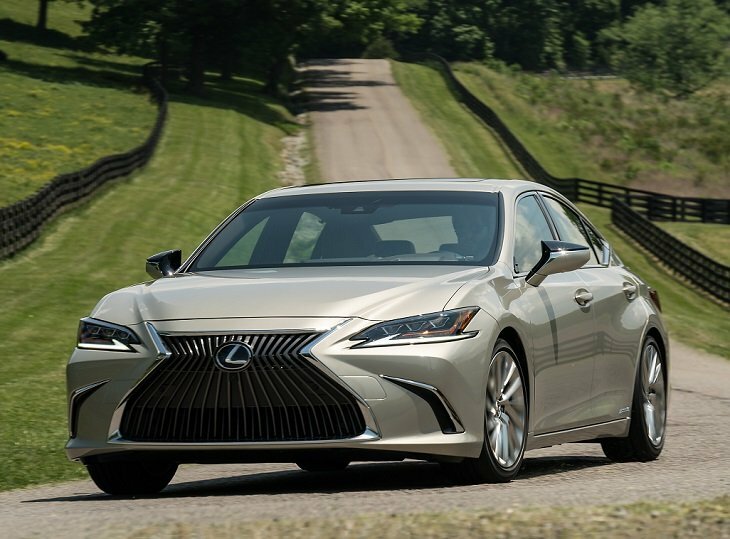 The 2019 Lexus ES pretty much embodies traditional luxury but with a modern twist. It’s comfortable, quiet, and makes you feel like God’s in his place and all’s well with the world. At the same time, when twists and turns present themselves, or you simply need to get ahead of traffic to make it onto an on-ramp located on the opposite side of the road from where you expected it, the ES is ready to rock. And along with its legendary reputation for reliability and the ES 300h’s real-world fuel economy (which is still impressive), this Lexus also delivers the luxury of peace of mind. Toyota Motor Sales, U.S.A. supplied the vehicle used for this 2019 Lexus ES review.